Saints Stephan’s Cathedral is the most important church in Vienna. It was founded in the 12th century. 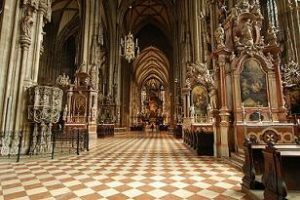 Inside the cathedral are many art treasures such as the tomb of Prince Eugene of Savoy, the Altar of Wiener Neustadt and the pulpit by Anton Pilgram. The cathedral is built of limestone and 107 metres long, 40 metres wide and it’s tower is 137 metres tall. Over the centuries, air pollution have turned the church’s white stones into a black color. Restoration projects have started to restore it’s original colour. 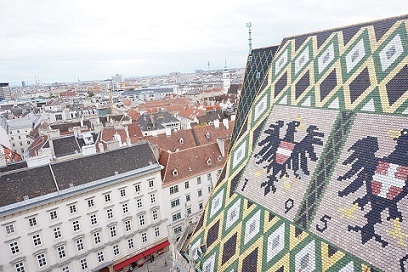 St. Stephen’s Cathedral is also famous for the mosaic roof which is covered with 230.000 glazed tiles. During World War II, the wooden roof was destroyed but with steel bracing it is rebuild. The tower has a height of 137 metres. Its construction lasted 65 years from 1368 to 1433. In the past, the tower contained an apartment for watchmen who manned the tower at night (till 1955) and rang the bells incase of danger. 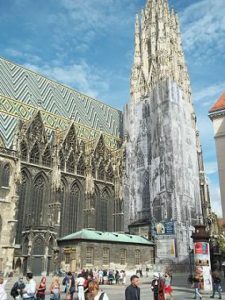 The cathedral is situated at the Stephansplatz in the heart of Vienna. At the square is a station for the metro (U1). Around the cathedral are several main shopping streets. To the Hofburg Palace is just a short walk.